Synonyms: Aortic arch syndrome, pulseless disease, aortitis syndrome, occlusive thromboaortopathy. Definition: Takayasu’s arteritis is a large vessel vasculitis of the aorta and its branches resulting in vascular ischemia. Etiology: Takayasu’s arteritis is associated with HLA Bw52 in >40% of afflicted individuals. Circulating antiarterial antibodies have been investigated as putative etiologic agents. Pathology: Granulomatous panarteritis results in concentric vascular narrowing. Lymphoplasmacytic cell infiltrates may be seen throughout the vessel wall but are often localized toward the outer aspects of the vessel. Demographics: Takayasu’s arteritis occurs worldwide, but most reports come from Japan, India, and China. It is rare in whites (2.6 cases per million persons per year). It predominantly affects women, usually in their reproductive years. Cardinal Findings: Variations in presenting manifestations often result in significant diagnostic delays. Fever develops in a minority of patients. Claudication, more common in the upper than lower extremities, results from ischemia of affected limbs. The subclavian (90%) vessels are a preferred site of involve- ment, but other large vessels including the aorta (65%), carotid (60%), renal (40%), and vertebral (35%) arteries may be involved as well. Pulselessness and pressure discrepancies between the two arms are common. A bruit over an affected artery helps identify an area of stenosis and is the most common clinical finding. The aortic arch may be more commonly affected in Japanese patients than in Americans. Pulmonary artery involvement occurs in as many as 70% of patients, but frank pulmonary hypertension is much less common. Hyperten- sion is present sometime during the disease course in 50% of patients and is often caused by renal artery stenosis. CNS symptoms such as light headedness, dizziness, and visual disturbances are well reported by >50% of patients. Musculoskeletal symptoms include chest wall pain, arthralgias, and myalgias and are seen in >50% of patients. Only 40% (30% at disease onset) of patients have constitutional symptoms such as fever, weight loss, and malaise. Stroke owing to vertebral or carotid ischemia or embolism has been described. Funduscopic findings of microaneurysms, venous dilation, and beading are noted early in the course of disease. Cardiac disease, including aortic regurgitation, angina and pericarditis, is seen in almost 40% of cases. Skin lesions, including erythema nodosum and hypersensitivity angiitis, have been reported. Uncommon Findings: Rare associations with other idiopathic inflammatory disorders such as inflammatory bowel disease and sarcoidosis have been reported. Diagnostic Testing: The ESR is elevated in only ~30% of patients. However, the ESR is markedly increased in ~70% of patients with active disease. Vascular specimens at the time of surgical bypass reveal histologic evidence of active disease in ~40% of cases. 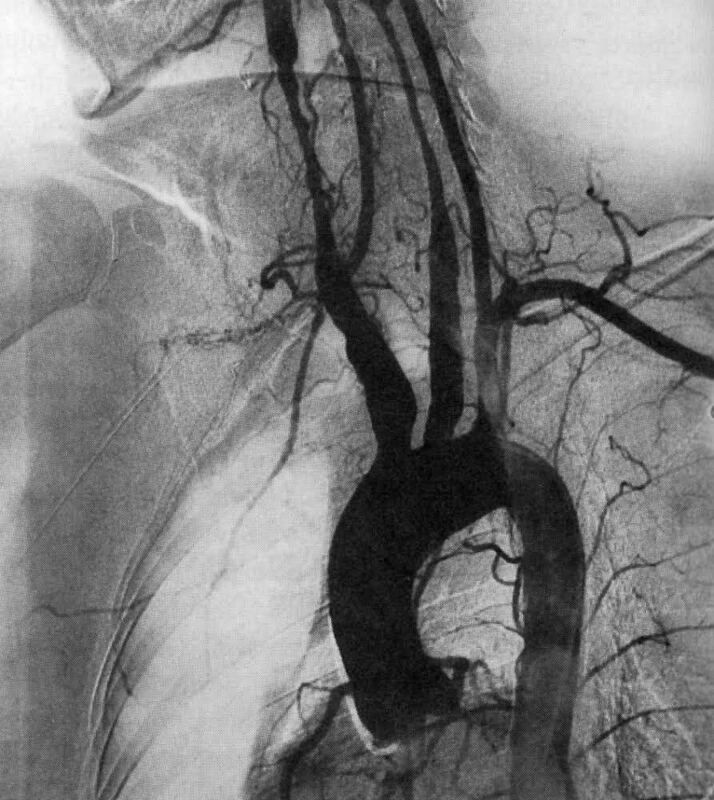 Imaging: Angiogram confirms a suspected vascular stenosis. Long-segment stenosis occurs almost four times more commonly than aneurysms (Figure). Magnetic resonance angiography is gaining prominence for visualizing vasculature, particularly of the aortic arch. The chest radiograph may demonstrate a widened aortic root or irregularities in other segments of the aorta. Keys to Diagnosis: Look for pulselessness of an extremity, often in young women of Asian descent. Aortography and angiograms of other large vessels is highly diagnostic. Diagnosis Criteria: The 1990 ACR Classification criteria include (a) age at onset 40 years or younger; (b) claudication of the extremities; (c) decreased brachial artery pressure; (d) blood pressure difference of >10 mm Hg between arms; (e) bruit over the subclavian artery or aorta; and (f) arteriogram abnormality. Criteria for Takayasu arteritis are met if at least three of these six are present (sensitivity, 90.5%; specificity, 97.8%). Therapy: High-dose corticosteroids should be given when active disease is diagnosed. Addition of MTX, TNF inhibitors (especially infliximab) or cytotoxic therapy (such as cyclophosphamide) both for disease control and as a steroid-sparing agent may improve outcome and result in fewer steroid complications. Based on promising, but limited and uncontrolled, case reports, tocilizumab and rituximab are under investigation. Vascular bypass may be necessary if limb or organ ischemia appears threatening but is fraught with significant reocclusion problems. Prognosis: The disease may be self-limiting in ~20% of cases. Approximately 25% of patients fail to achieve remission despite aggressive therapy. Half of the patients who respond to medical therapy later relapse. Arterial hypertension is an unfavorable prognostic indicator. Mortality is low (10%–20%), but considerable morbidity is related to organ and limb infarction (stroke, myocardial infarction, aortic dissection).